Researchers at the University of Guelph have completed the first detailed study of the birthplaces of monarch butterflies that overwinter in Mexico, information they say could help guide conservation efforts for the iconic but threatened migratory insect. The researchers analyzed the chemical composition of wing tissue samples from more than 1,000 specimens collected over a period of nearly 40 years to determine where the butterflies had lived as caterpillars, then looked for patterns in the large data set. What they found was surprising, says lead author Tyler Flockhart, a Liber Ero postdoctoral fellow in the Department of Integrative Biology at the University of Guelph. "We went into the study expecting that most of the butterflies were going to be coming from the Midwestern U.S. states, and we did find that, but the proportion of butterflies coming out of the Midwest was lower than we thought," Flockhart says. 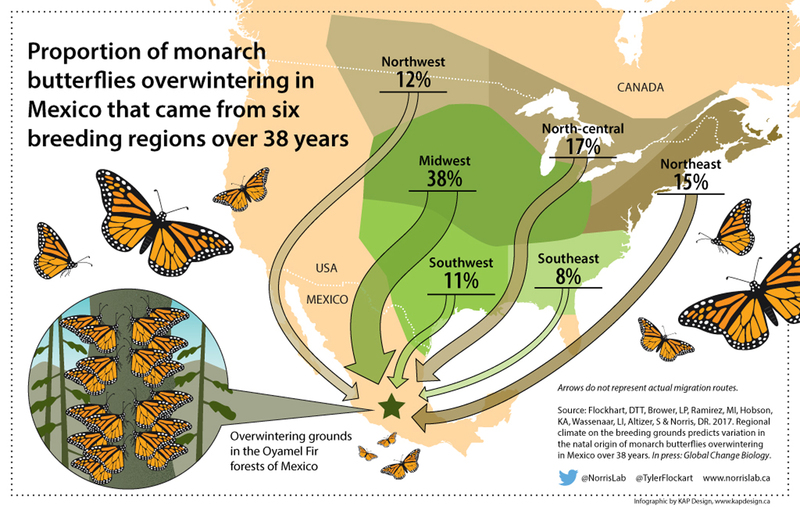 About 40 per cent of overwintering butterflies originated in the Midwest, but as the infographic below shows, the balance of the population came from other areas across a wide breeding range, meaning conservation efforts focused solely on the Midwest would neglect the majority of monarchs. "I think the study suggests it might be better to spread conservation efforts a little bit wider to try and ensure that this population doesn’t disappear," Flockhart says, adding the data underscores the challenge of trying to rehabilitate a species whose range spans four million square kilometres over three different countries. "A lot of people can relate to migratory animals and understand large-scale movements, but how do we implement conservation strategies across such vast areas and between independent countries? It's really complex and I don't think it's been tackled yet." The North American monarch population has declined by 80 per cent over the past two decades, in part due to the disappearance of milkweed, the butterflies' primary food source during the reproductive season. The insect is currently listed as being of special concern in Canada, but following a recent review, the Committee on the Status of Endangered Wildlife in Canada (COSEWIC) has recommended its status be changed to "threatened."